Early Start Russian was filmed in London, with the huge Russian community. They show us what real Russian families are like at home, what they eat and the language they use everyday. ​We share their celebrations and hear their authentic pronunciation of the language. We also see them in Saturday school where children from Russian families learn the language most of them also speak at home. 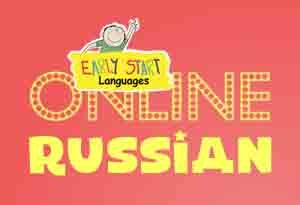 The production of Early Start Russian was part-funded by the Esmée Fairbairn Trust as a contribution to the "Discovering Language" Project, under the direction of ASCL (Association of School & College Leaders). The Project Director is Peter Downes, Past President of ALL (Association for Language Learning). Ch R1.01: "Hello and goodbye"
Ch R1.02: "How are you?" Ch R1.03: "What's your name?" Ch R1.05: "How old are you?" Ch R1.08: "Where do you live?" Ch R1.11: "Days and months"
Ch R1.13: "Food and drink"